SACRAMENTO – The Governor's recent proclamation that Californians must cut water usage by 25% certainly caught the attention of Californians and pundits nationwide. Featuring threats of fines of up to $500 per day, and even restrictions on personal shower habits, Governor Brown wasted little time getting right to class warfare over our green lawns. Unfortunately, he and the ruling Democrat party once again took a pass and resorted to draconian rationing measures and heavy handed fees, while offering no leadership and no real solutions to California’s current water crisis. While it is true that we are in a drought, the little known fact outside Sacramento is that our water problems could be substantially eased if the Governor and his Democrat party chose to demonstrate real leadership on the issue. The current water crisis has presented an opportunity for actual problem solving, but if “what’s past is prologue” what should we expect? Solutions and leadership, or rhetoric and rationing? History does not paint a hopeful picture. Since 1970, Democrats have enjoyed virtually uninterrupted control of the State Legislature. At any time, they could have taken action to address our water infrastructure shortcomings and the inevitable droughts that cycle through California. Our State Water Project, passed by Jerry Brown’s father Governor Pat Brown, was designed to serve a state population of less than half of today’s population. Nearly every year since 1970, Republicans have put forth plans at the state and federal level to create more water storage, better conveyance systems, sound environmental protections, fewer over-burdensome regulations, and the streamlining of frivolous environmental lawsuit delays. Each time, the Democrats in Sacramento have squashed efforts to take substantive action to move toward construction of additional and more reliable water supplies. 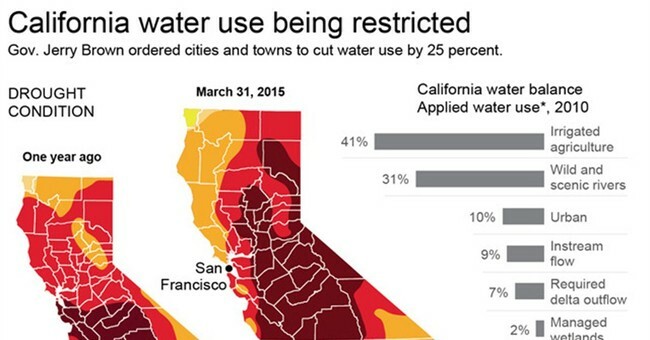 In reality, California has less of a water supply problem and more of a water mismanagement problem. This is illustrated by the fact that we allow over 40% of our state’s water to drain out into the Pacific Ocean. The numbers are easy: our average annual water runoff is at 71 million acre-feet, while our average water use is 42 million acre-feet. The "excess" drains into the Pacific. The California State Water Project is the largest multipurpose, state-built water project in the United States. The system was designed and contracted to deliver 4,200,000 acre feet but in an average year delivers only 2,300,000 acre feet because many of the original planned features were never built. In addition, simple ideas like increasing our total water storage by building 3 new dams have been mired in unnecessary environmental legal challenges for years. California voters recently passed the Proposition 1 water bond, which despite promises will likely never result in actual construction of additional water storage – just more money for pet projects and empty rhetoric from the Democrats in Sacramento. Innovative technology solutions, like desalination, also represent viable solutions to increase net water supply and reduce dependence on Northern California water sources. Many coastal cities are trying to move forward, but are being faced with the active opposition of Sacramento bureaucrats and unnecessary regulatory burdens. Unfortunately, viable options such as these have no place in the discussion, because they offend the orthodoxy of environmental special interests and the sensibilities of the liberal elites whose campaigns they fund. Not only are we looking at a drought decades in the making due to political games and favoritism to special interests, the Democrats are now using this crisis to leverage more radical government expansion and overreach through nanny state declarations, arbitrary fees, and rationing. So rather than applauding Jerry Brown for forcing Californians to reduce their shower times, lawn watering and car washing, perhaps we should instead be demanding that the Governor turn up the heat on Sacramento Democrats, show some vision for the future generations, consider viable opportunities, and actually utilize the already available water supply in California.